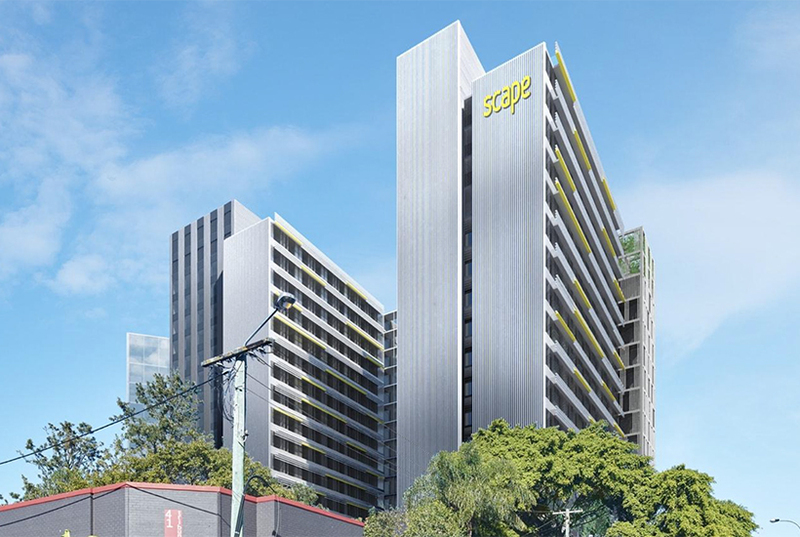 Scape Student Living is capitalising on a surge in international and local students in Queensland by opening its Toowong development in Brisbane almost six months early, in time for the start of the 2019 academic year, reports The Australian. Whilst the off-the-plan apartment market has faltered due to credit tightening and a withdrawal of overseas investors, student housing demand across Australia has surged on the back of international enrolments increasing almost 80 per cent to 540,000 in the last five years according to Department of Education figures. This is creating huge appetite for new developments and has drawn in international players like Cedar Pacific, Atira, Scape, GSA, Iglu and Wee Hur to the major capital cities. Scape Student Living owns 14 student accommodation developments in Sydney, Melbourne, and Brisbane, and it has 5,500 more rooms under construction and at the planning stage in its $1 billion portfolio. It is forging ahead with its business model targeting students, avoiding the slump in Brisbane’s unit market. “The changing demand profile of international students in favour of purpose-built student accommodation over the risks inherent in homestay arrangements and private residential bookings is becoming increasingly apparent,” Scape Australia chairman Craig Carracher said. Mr Carracher said students who had previously taken up homestay and private rentals were “starting to transition to the purpose-built student offerings”. “The Australian purpose-built student accommodation market is maturing and the segmentation in the sector is becoming more transparent to the student consumer,” Mr Carracher said. Student accommodation operators have cited the convenience, service, and safety advantages of purpose-built student accommodation over other forms of housing that are not tailored to student needs. Meanwhile in Melbourne, Frank Knight commercial sales director Ed Wright said there were “aggressive commercial buyers” in the student housing, office and hotel sectors “eager to swoop in and pick up any slack from residential developers”. The AFR reports that offshore-based developer and fund manager Cedar Pacific has bought two high-rise development sites in the centre of Melbourne in the space of just a few months. According to its website, Cedar Pacific has completed five student housing projects in Brisbane, Melbourne, Adelaide and Auckland with another five in the pipeline. “The council and the state government are beginning to understand the supply of student accommodation needs to come forward a few years,” Scape’s Mr Carracher told The Age. “Melbourne’s been under-supplied for 10 years. When we opened our first 300 beds at 393 Swanston Street in February, we were booked out in weeks. Every time we’ve opened another lot of rooms, they’ve been leased out in weeks,” he said. Melbourne has a ratio of one bed to 10 students compared with London’s 1:4 ratio, he said, and Scape is on the hunt for more sites. Some commentators claim that developers in the booming student housing sector are providing an escape route for failed apartment projects in the Melbourne CBD as off-the-plan sales tank. Last week, the University of Tasmania abandoned plans to house students in a floating hotel in the wake of Hobart’s current housing crisis, reports the ABC. The university is now planning to refit the old commerce building off French Street in Sandy Bay to house 170 students after being forced to delay plans to install prefabricated shipping container accommodation for 180 students at the Christ College precinct. That accommodation is now not expected to be available until the second half of this year.